Artillery was to form the defining part of World War One, with huge casualties on all sides from its effects. British artillery in 1914 was formed in to three elements: Royal Horse Artillery was more mobile, Royal Artillery had heavier guns and Royal Garrison Artillery was the more defensive element with the heavy guns. 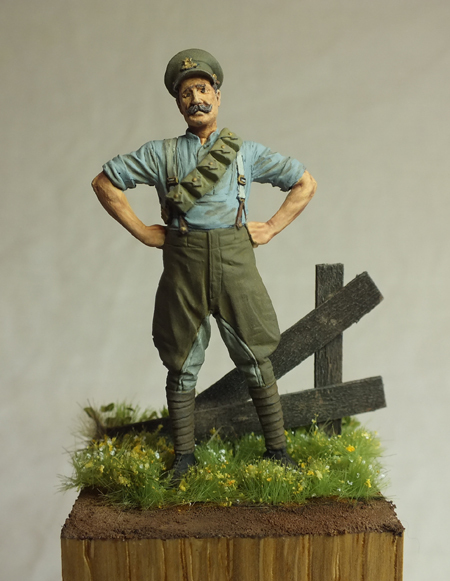 The Royal Horse Artillery Bombardier posed here can be seen with his 1903 bandolier and cavalry cut trousers. His shirt is the famous British ‘greyback’ commonly described as “warm in summer and cool in winter”.